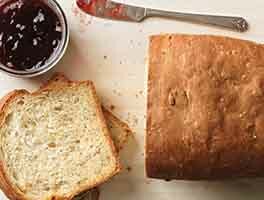 Bread baked in a bread machine doesn't have to be a plain and simple loaf. 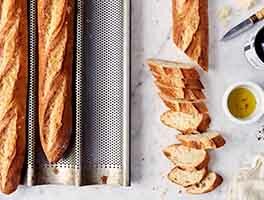 By using your Zojirushi's homemade menu, you can let the machine knead the dough, then take it out, shape it, put it back, and kick back while the Zo bakes up this beautiful loaf of herb-garlic pull-apart bread. 50 mins. to 60 mins. 2 hrs 40 mins. to 3 hrs 10 mins. If you have a Zojirushi Virtuoso, program it as follows: no Rest; Knead 20 minutes; Shape on (it will read 1:00); Rise 1 off; Rise 2 off; Rise 3 60 minutes; Bake 52 minutes. Include the Keep-Warm option or not; your choice. If you have a different model Zojirushi, you can program it much the same way, though you won't have the Shape option. Program as follows: no Rest; Knead 20 minutes; Rise 1 off; Rise 2 20 minutes; Rise 3 60 minutes; Bake 52 minutes. Include the Keep-Warm option or not; your choice. 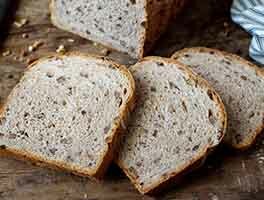 Combine all of the dough ingredients in the bucket of your bread machine, and press start. Check the dough after about 13 minutes of kneading; add additional flour or water as needed to make a soft, smooth dough. For the Virtuoso: after 20 minutes of kneading, the Shape cycle will begin. Remove the dough from the machine, and set it on a lightly greased work surface. Remove the paddles from the machine. For other models Zojirushi: After 20 minutes of kneading, remove the dough from the machine, and set it on a lightly greased work surface. Remove the paddles from the machine. Divide the dough into 32 pieces. You don't have to be super-accurate here (though, if you use a scale, you can be). Shape the pieces into smooth balls — or not; ragged pieces will make just as tasty (though not as pretty) a loaf. Dip the top of each ball into melted butter; you probably won't use all the butter. Lay 11 balls into the bottom of the Zo pan, buttered side up. Sprinkle with half the mozzarella or pizza cheese. Use 11 balls of dough to make a second layer; top with the remaining cheese, and the Parmesan, if you're using it. Top with the final 10 balls of dough; again, make sure their buttered sides are up. Place the pan back in the machine. For the Virtuoso: press Start. This will move the machine to the next cycle. For other models: no need to press Start, the machine will continue on its programmed cycle automatically. When the bread is done, remove it from the machine, and turn it out of the pan onto a rack. Brush with any remaining melted butter. Serve warm; marinara sauce is a nice accompaniment. Store any leftovers at room temperature for several days; freeze for longer storage. Yield: 1 large loaf, 8 to 10 servings. 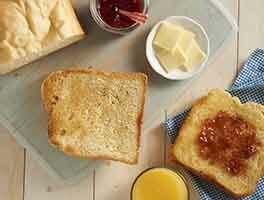 Want to make this without a bread machine? Prepare the dough, and divide it into pieces. Layer the pieces, as directed at right, into a lightly greased 9" loaf pan. Allow the bread to rise until it's crowned about 1/2" over the rim of the pan; bake it in a preheated 350°F oven for 40 to 45 minutes, until it's golden brown and an instant-read thermometer inserted into the center registers at least 190°F. 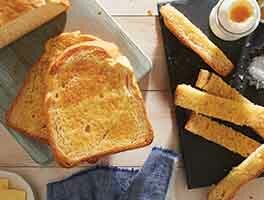 Remove the bread from the oven, and after 5 minutes turn it out of the pan onto a rack to cool. I don't have a bread machine, so I just used my kitchenaid with the dough hook attachment. I used potato starch instead of potato flour because that's what I had. The dough was really easy to work with, it baked up absolutely beautiful, and I loved how customizable it is. I added a few types of cheese including asiago!! The only complaint I have is that in a 9 inch loaf pan, it spilled over and made a mess in my oven. It also set off the smoke detector. Wonderful! I used bread machine to do the mixing and kneading and first rise, then finished the recipe out of the bread machine. Served warm with marinara sauce. Great! This was so easy. I made this in a Kitchen Aide stand up mixer with the dough hook. I allowed the dough to knead for about 12 minutes using the hook. The dough was smooth and easy to roll. I used KA pizza dough flavoring and powdered Cheddar cheese as seasoning. Dough rose well and looked impressive. Great flavor. Will defiantly make again. Party guests love it! I have a different brand of bread maker. First time I did not use the layered ball technique. second time followed the layered ball technique. BOTH WERE EXCELLENT!!! I don't have a Zo bread maker but i was determined to use my own Cuisinart CBK-100 2 LB Bread Maker. The bread turned out GREAT! The Cuisinart beeps 6 times to notify you to remove the kneading paddle. I removed the paddle, cut the dough into several misshapen balls and put it all back into the bucket to cook. It turned out great and went so well with homemade meatballs and sauce. I can't believe this doesn't have more reviews? I didn't have the seasoning listed so I used pizza seasoning and butter garlic seasoning. I think I'll use more next time. Wow it was so good. I'm going to make this for the next event I go to that I need a dish for! It's pretty, and tasty, and easy to serve!